The National Fund for Entrepreneurship Support (NFES) under the Economy Ministry of Azerbaijan has begun accepting investment projects on priority development areas of the Gazakh region. 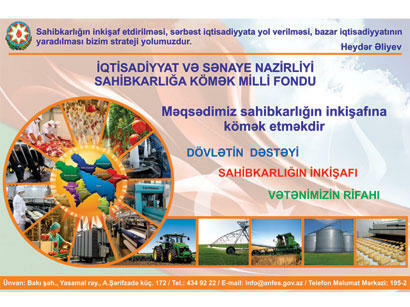 Following the business forum , the NFES considered it expedient to start accepting business proposals for financing startups, as well as investment projects for the creation of agro-parks, hotels, green markets, potato, livestock and beekeeping farms, meat-cutting, milk processing and bread production enterprises. Entrepreneurs can apply to the Fund through authorized banks and non-bank lenders, in accordance with the rules for using the funds of the NFES. Small projects can be fully financed through concessional loans. About 150 million manats ($88 million) will be issued for granting preferential loans to entrepreneurs in 2017. The main goal of the Fund, which was established in 1992, is to provide preferential loans from the state budget for small and medium business, in order to develop entrepreneurship in the Republic of Azerbaijan. Allocation of funds by NFES is aimed at the minimizing of the impact of global economic crisis to the national economy and mitigation of its dependence on the oil sector. Encouraging business doing in the country is one of the priorities for the Azerbaijani government, which supports entrepreneurs through creating necessary conditions for the development of a healthy business environment in the country. The Gazakh region of Azerbaijan is located 470 kilometers from Baku. In an area with a variety of terrain, you can find both mountains and expansive plains. Scientists believe that the base of Gazakh was laid in the 8th century AD. by Arab commander Marwan ibn Muhammad. The place of residence, laid by the commander, was called Casal. There are carpet, cotton-spinning factories, as well as food industry enterprises, agricultural technical school, medical school in the city. Even in the Soviet years, Gazakh was considered the center of carpets with high pile.